2011 started with such hope for me. My wish was simple; happy family and health to all my friends and family. We started the year with great expectation by sending my son off to Tokyo to work on a Fellowship. A once-in-a-lifetime opportunity to work for NTT (Nippon Telegraph and Telecommunications) doing research. He was to be there until August, and we were all going in May to visit. Then March 11, the horrendous earthquake and Tsunami hit Japan, and the slow moving Nuclear disaster that followed. After an anxious week of worrying and being glued to the Japan news media, he was sent home as there was no power for his research laboratory. My heart aches still for the people of Japan and the aftermath that they are still dealing with. While worrying about that disaster and it’s impact, I sent out email updates to friends and family. That is how I learned that my dear friend Judy of 30+ years was starting her own battle with ALS. It has been a long journey, and we have used the opportunity to visit, travel and connect with long-lost friends. This has been one of my hardest travels, not one that I would wish on anyone. I spent the past couple of days looking at all of my projects from the past year. 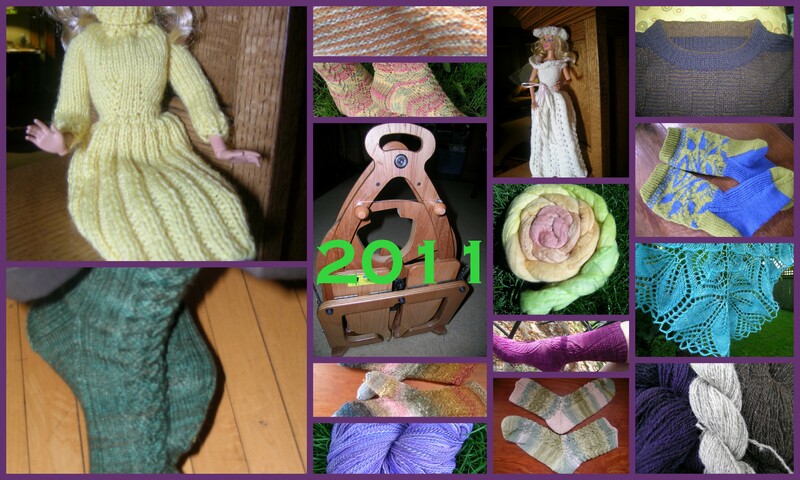 It was definitely the year of spinning, I spent so much time spinning, and very little time knitting and finishing up past projects, in spite of my resolution a year ago. I need to stop with the resolutions. I am pleased with how my spinning progressed, and I had a wonderful 3 weekends of spinning lessons at various events. Looking forward to more of that in 2012. Please let 2012 be an uneventful year of peace, health and happiness.